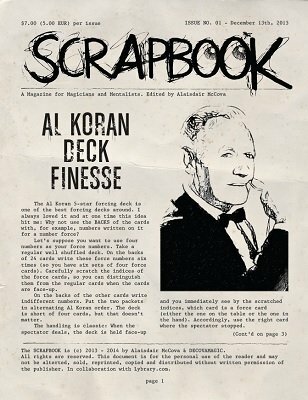 AL KORAN FINESSE - An additional idea for the well-known Al Koran 5-star forcing deck which enables you to perform a baffling version of the "Oscar" card trick. THROUGH THE LOUPE - The fastest loading technique for a ring in a sealed envelope. This one has fooled more than one magician! CLIPPED OUT - A concept for a headline prediction or a live prediction. Some subtle thinking behind this one. MAGIC VS. MUSIC - A thought provoking article on practise, performance and more. Music is compared to magic and this will get you started thinking different about our art. ENTHYMEMATA - Various thoughts, tips and hints.